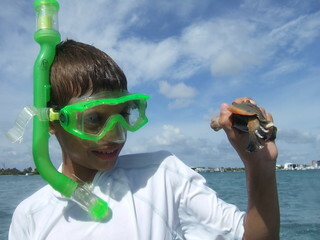 COOL SEA CREATURE ENCOUNTERS!!! Morning session. We”ve just finished up another wonderful week of Fun and Adventure on the Lake Worth lagoon and what an AWESOME week we had. First, we were lucky enough not to get rained out by tropical storm Debbie, though we did have a couple of short term torrential downpours without lighting, that gave a chance to hide out under the bow canopy on the boat while it rained catfish and dogsnappers! We all thought that was rather cool, and once the rained cleared, we were having FUN like there was no tomorrow! 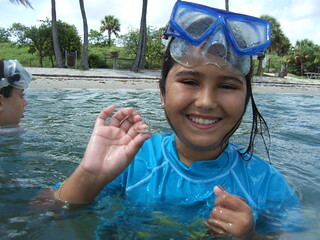 We snorkeled Peanut Island, the Rock Garden, the Big Sandbar and Blue Crab Beach for hours on end. We trolled plugs along the drop offs and caught big barracudas until the hooks broke off our lures and there wasn’t any paint left on them! 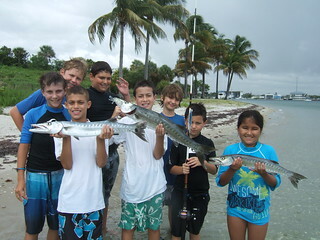 We were catching barracudas by the boatloads and all of us taking turns reeling them in. It was just GREAT! What FUN days of fishing we had!!! We caught them all!!! 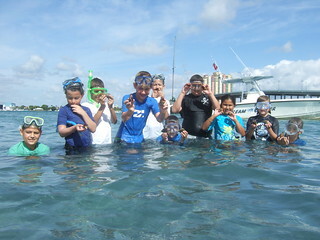 Everytime we went by the Big Sandbar, we stopped to take a quick snorkel and found beaded starfish, cushion starfish and 9 armed starfish by the handfuls. The fighting conchs were in by the hundreds, most laying eggs, and it was a cool thing to watch as they laid their eggs in spaghetti like masses. It didn’t take us long to pick up a few for a quick photo op, then back to snorkeling, exploring and chasing crabs we went! Along the way, AJ came up with a big fighting conch that had a real attitude and everytime he held it up for us to see, that fighting conch would stick out its long foot and poke AJ in the hand to try and make him let it go! It was just great watching that happen over and over!!! Nice job not letting go AJ!!! 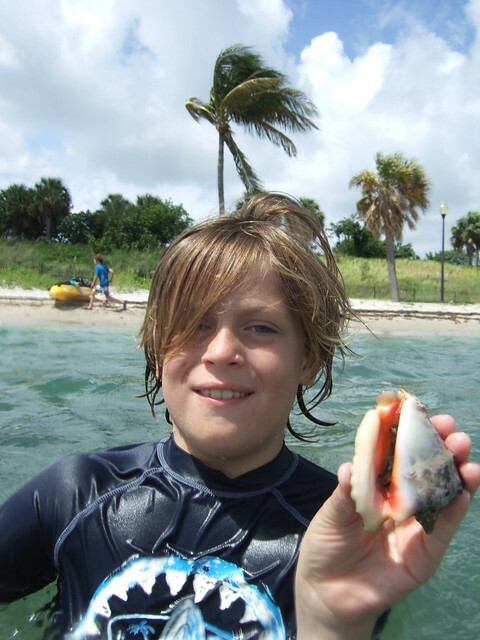 While AJ was messing with that fighting conch, Tripp was swimming around and coming up with a few fighting conchs of his own, plus one big giant 9 armed starfish that was truly a whopper!!! It was a nice find and we all loved it!!! Way to go Tripp!!! Another day we were snorkeling around Peanut Island and came upon a really nice, BIG, short spined burrfish just swimming by!!! It didn’t seem to mind us picking it up or even try and get away. It just puffed itself up with water everytime we came near and became a big round ball of thorns and almost impossible to handle. It knew we weren’t going to eat it now! Talk about a cool defense mechanism! That fish was down right thorny, but Joseph didn’t seem to mind!!! 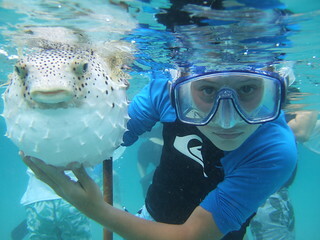 We all took turns checking that awesome pufferfish out and were extra careful not to get our fingers anywhere near the mouth. Those fish can bite! Nice job Joseph! 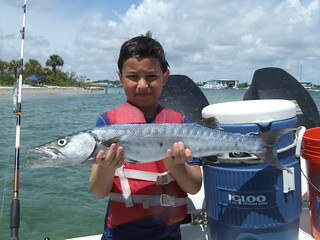 Another day while trolling a plug along the edge of the Big Sandbar, another big barracuda decided to eat it for lunch! This time it was Owen’s turn to reel one in and we had a ball watching him reel that nice barracuda in while it jumped a dozen or more times out of the water. This week there seemed to be barracudas in by the hundreds and we kept a few to put in our crab traps, and gave a couple more away to some people who wanted them for for dinner. The action was almost non stop all week and we loved that too!!! Way to reel that fish in Owen!!! Another morning we stopped by Blue Crab Beach and it wasn’t long before everyone was catching juvenile blue crabs and sand crabs by the netfuls! I’m not sure how many everyone caught, but about an hour later we had a bucketful of crabs that was about half full!! 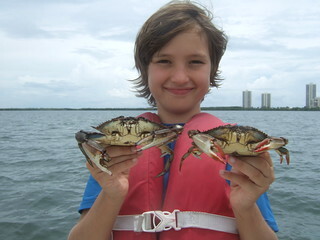 I know Julia was sure having FUN catching one crab right after another! When we let them go, it was awesome watching them scurry out of that bucket in every direction and dissappear into the sand, right under our feet!!! 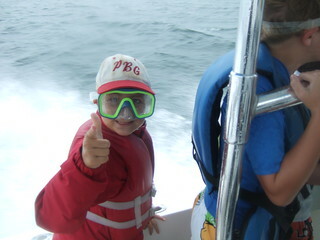 Julia you rock as a crab catcher!!! Later in the week we went and checked one of the crab traps that we had baited with a piece of barracuda, and sure enough, it was filled with some big blue crabs that seemed to have some big attitudes to match! I carefully took a few out and showed everyone the safe and proper technique to holding big crabs with some serious attitudes, bare handed without getting pinched no less! Needless to say, Beau sure had FUN when it came his turn to pick up a few!!! Nice Job Beau!!! On Wednesday morning we stopped by the Big Sandbar on the way to the Rock Garden and found quite a pile of 9 armed starfish buried in the sand. They seemed to be crawling out and moving about just as we got there. We had a strong rain that morning and I wondered if all the fresh water was making them move into deeper water. They are always a great find and the group loves them! I know Ethan loved picking them up by the handfuls!!! We all did!!! Way to go Ethan!!! Later that morning we snorkeled around Peanut Island and found fighting conchs, milk conchs and some really colorful hawkwing conchs. We collected a few to check out and watched as they “hopped” about on the bottom and headed off into deeper water. Jake found one that was extra colorful. It was an awesome find Jake!!! 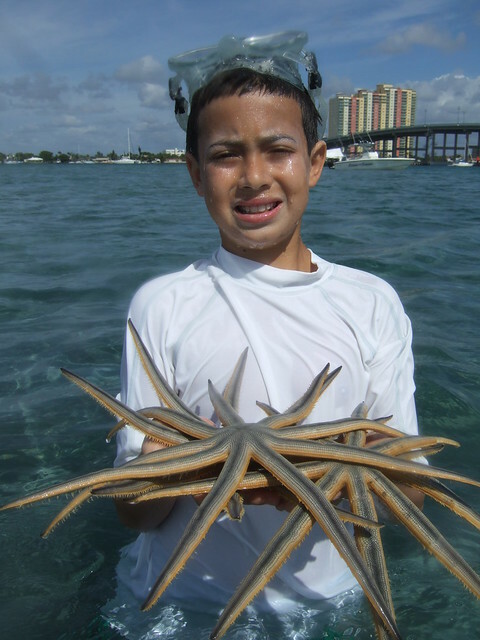 While we were finding hawkwing conchs and chasing sharp nosed pufferfish with our nets, Brett came up with another nice 9 armed starfish and put it on his head like a hat. 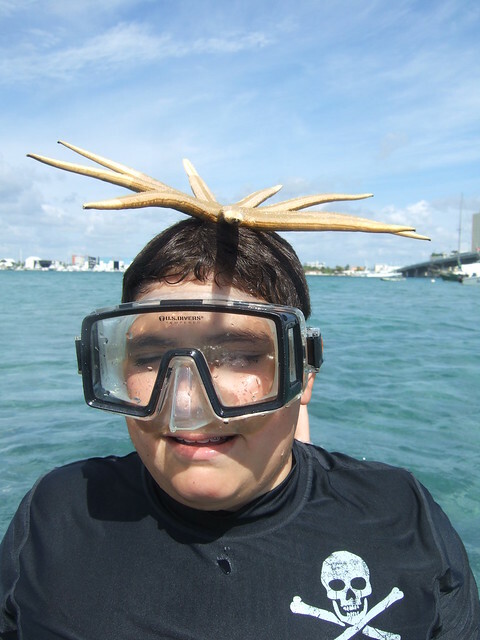 It seemed to fit just perfectly and gave him a cool starfish hairdo!!! 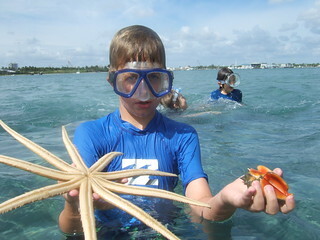 Way to rock that starfish hairdo Brett!!! On the last morning on the way back to the dock, tropical storm Debbie decided to throw one more big rain cloud right on us. As we raced towards the dock the rain came down in buckets and stung our faces! When I looked over at Max, I saw that he had put his mask on and was wearing them like high speed racing goggles. It was awesome!!! He was loving every second of it and giving me the thumbs up!!! I could sure tell he was having Fun!! !Way to use your head Max!!! A few seconds later, we all were wearing them and smiling like there was no tomorrow!!! How cool is that!!! Needless to say, we had a fabulous week!!! We had Fun!!! We had Adventure!!! We had some Cool Sea Creature Encounters!!! And we learned a pile of stuff along the way!!! It just doesn’t get any better than that!!! I just can’t wait to do it all over again!!! To check out the rest of the photos from this weeks session, please click on “Check out our FLICKR photostream” found a little bit down on this home page on the right side and go to “June 19 -22, 2012 AM session”. ENJOY!! !